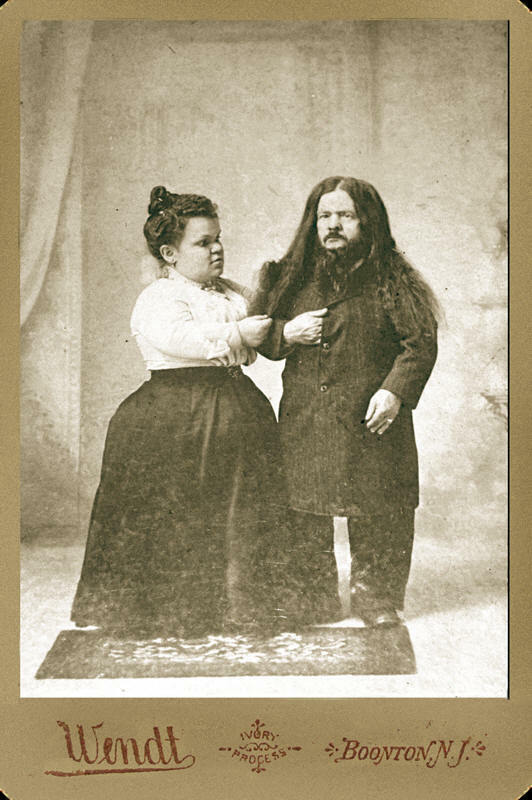 Miss Olof Krarer, "the Little Esquimaux Lady,"
Late 19th century curiosity in the "primitive" peoples o f the world fueled the career of one of the era's most unusual lecturer-performers, Miss Olof Krarer, the Esquimaux Lady. 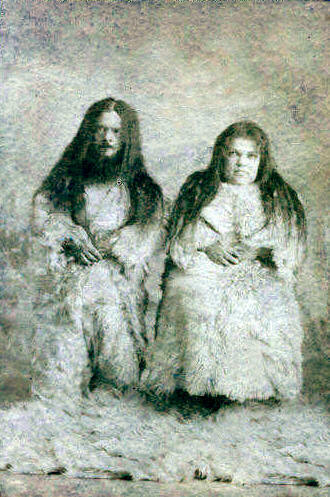 Krarer hailed from Angmagsalik on the east coast of Greenland, a member of an isolated and diminishing tribe of about 500 blonde-haired, blue eyed natives said to be descended from Danish colonists. Cut off from the modern world and subsisting on a diet of raw meat, blood, and oil from the native fauna, the Angmagsaliks' bodies had shrunk to dwarven proportions. The Angmagsaliks were said to have been discovered in 1873 by six shipwrecked Icelandic sailors. Three native families offered the sailors their sled dogs for transportation in exchange for passage to Iceland, one of these being Olof's own family of ten. It took two months for the party to cross the frozen ocean to Iceland, a distance claimed by the sailors to be over one thousand miles. On arrival in Iceland, the tiny natives were treated as curiosities. They were weighed and measured and the tallest among them, Olof's father, was said to be but three feet, five inches tall. The "heathen Esquimaux" were of particular interest to Lutheran missionaries, who immediately set about Christianizing them. Olof's family was placed in a Lutheran school where she was taught Icelandic over a period of five years by a teached named Ion Thorderson. Because the Esquimaux had never walked any distance before, they were sent to and from school on horseback. One of Olof's school books was a history of America and she desired to go there, so she and her father joined a group of five Icelanders who set up a colony in Manitoba. 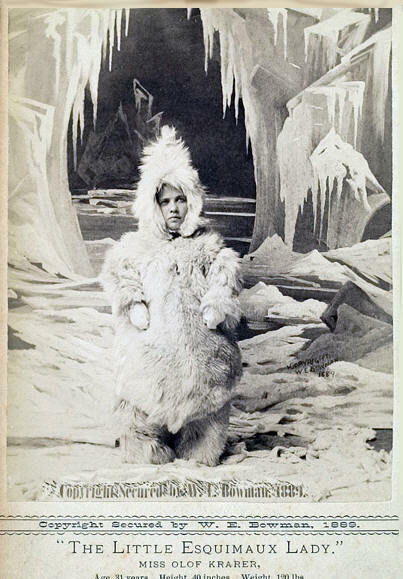 In 1884 Olof gave her first lecture as "The Little Esquimaux Lady", regaling audiences of gawking Midwesterners with stories of "Life in the Frozen North". Clothed in her "native costume" of a polar bear skin parka, she spoke about her people and their customs and sang native songs. Her face was "peculiar, and almost impossible to portray" and her arms bowed, which she claimed was due to her people�s custom of keeping their arms folded at all times to ward off cold. All people of her race, she stated, were of similar height and build. The Esquimaux, she explained, lived without laws or government, the only distinction being that between rich and poor: the rich were those who had flint to strike fires, and the poor were those who did not. The Greenlandic language was described as quite primitive and consisted of only about one hundred utterances, all related to things in the tribe�s immediate vicinity. Thus, American audiences were quite impressed by the ease with which Olof learned the more complex "Icelandish" and English languages. The Angmagsaliks did not bathe or comb their hair but oiled themselves occasionally with animal fat, and those whose faces shone the brightest with grease were considered the most attractive. They did not cook, eating their diet of raw meat and animal fat without the aid of dishes or silverware. The children did not attend school and were taught everything they needed to know by their parents, and were disciplined by branding with a heated piece of bone. Without wood, they burned animal fat and bones for warmth. Upon moving to Iceland, Olof claimed she was so surprised by the custom of bathing that when she was first given soap she tried to eat it. Once she had washed away years of accumulated filth she was found to be as fair-skinned as any Icelander. The Angmagsaliks of Olof's stories were without doctors but suffered only from one sickness, believed by Western doctors to be tuberculosis. They were also occasionally blinded from sunlight reflecting off the snow during the six-month-long daytime. Having no wood with which to build, they used half of a large frozen fish as a sleigh. Olof described her people�s sled dogs as being akin to English sheepdogs. Olof's earnings as a lecturer allowed her to purchase a home in West Ottawa, Illinois, where in the wintertime she was said to stroll about the town wearing summer clothing, her Eskimo genes making her impervious to cold. She adapted to the mild summers by lining a room of her home with blocks of ice, creating a makeshift igloo. If Olof's tales of Greenland life sound farfetched, it's because in reality she'd never even been to Greenland. 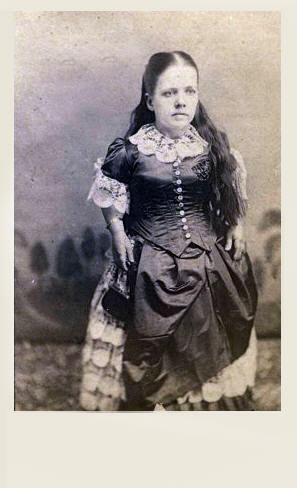 She was really Olof Solvadottir, an achondroplasic dwarf born in Iceland in 1858. Her bent arms were not the result of constantly warming herself but were a classic symptom of her condition. Although Angmagsalik (Ammassalik) is indeed a real town on the southeastern coast of Greenland, no dwarf race has ever existed there, or anywhere on the island. The deception was first publicly uncovered in 1892 by Jon Olafsson, an Icelander living in Winnipeg, in an open letter to the Manitoba Daily Free Press. He noted that although Olof is an Icelandic Christian name, the surname Krarer does not exist in any language (Solvadottir, on the other hand, is a common Icelandic surname, the -dottir suffix meaning "daughter of"). Most absurd to Olafsson was Miss Krarer's tale of her passage to Iceland. "I most positively assure you," he wrote, "that the possibility of walking over the ice from Greenland to Iceland, is exactly the same as walking from Manitoba to the moon over the rays of the rainbow." Indeed, nearly two hundred miles of open ocean separate the two islands at their closest points. Olafsson's editorial did not seem to impact Olof�s career however. "The Little Esquimaux Lady" continued to captivate American audiences with her outlandish tales and "native" songs and dances up until her death in 1935. 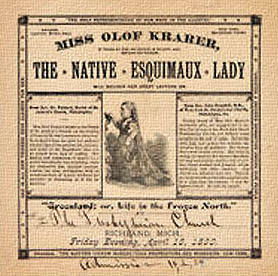 In 1887 her autobiography Olof Krarer, the Esquimaux Lady: A Story of her Native Home, ghost-written by Albert S. Post, was published. In the wake of her popularity and the speculation about mysterious, miniature tribes hidden away in the frozen wastes of the Arctic, other little people jumped on the Eskimo bandwagon. 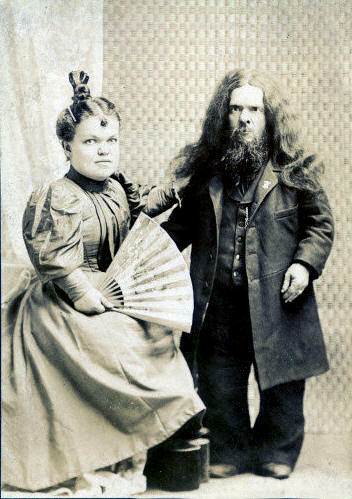 General Frank "Shorty" Shade of Kendalville, Indiana became "Chief Debro, the Eskimo Midget", and he and his dwarf bride Sarah donned furry costumes and wore their hair long and unkempt. 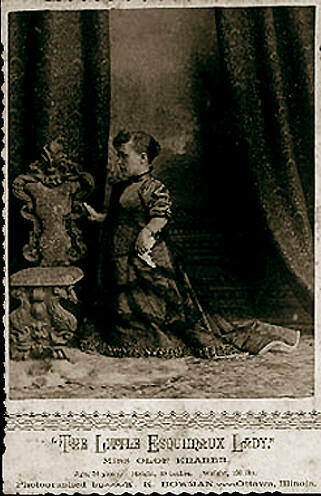 French sisters Leontine and Louise Selles called themselves "Les Soeurs Esquimaux" and a so-called "Esquimaux Family" exhibited in Britain consisted of mother Madame Stella, daughter Miss Corabella and son Prince Mignon, all three of whom appeared to have pseudoachondroplasia. In 2004, Olof eskimoi: aevisaga islensks dvergs i Vesturheimi*, a biography of this remarkable little woman, was published in Icelandic; however, it has not yet been translated to English.